Has your cat ever disappeared and when you finally found him he was curled up peacefully inside an empty storage box? If that's happened to you, you'll understand what makes these modular cat condos so cool. Cats seem to have a natural affinity for cardboard boxes, and that's not really hard to understand, since they're the perfect place to hide, sleep, jump off and chase each other. So when the owners of this company noticed this proclivity with their own cats, they decided to expand on the idea by developing these cat habitats with their team at Catty Stacks. 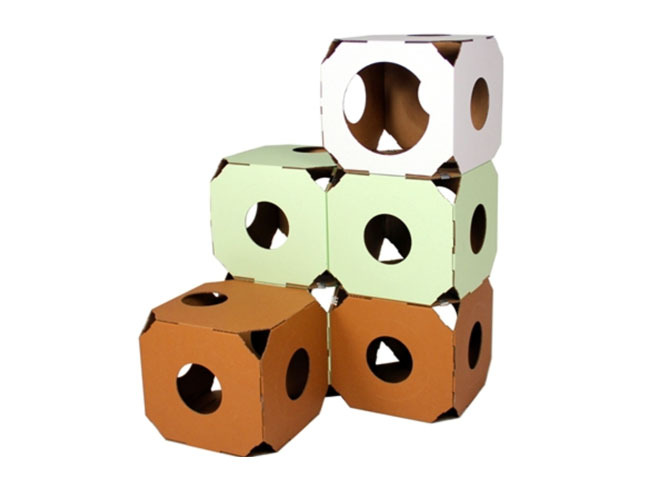 What makes these Catty Stacks so much better than ordinary cardboard boxes is that they have endless configurations which allow them to fit together into almost any space in your home. 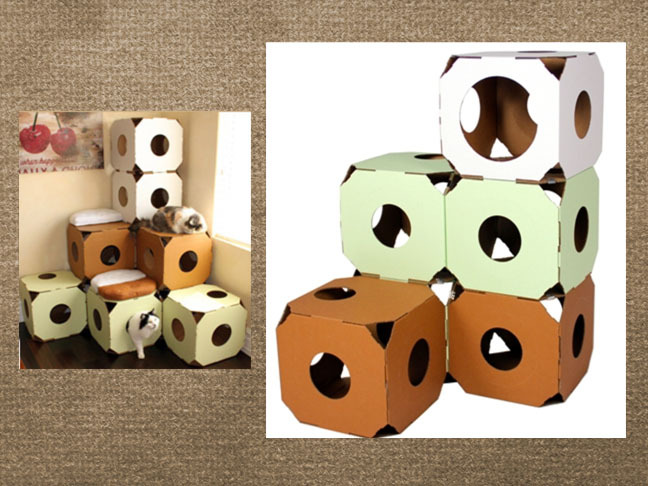 Your cat will love that these boxes give them a safe place to play and hide. And if you have more than one cat, these Catty Stacks will soon become their playground for hiding and chasing each other. And the texture of these boxes can also provide a safe scratch zone, which can satisfy your cat's urge for scratching and help save your furniture too. You'll appreciate that they're lightweight yet durable, economical and eco-friendly and their contemporary design makes them great accent pieces for your home too. And they're not just for cats either, they can also be used for smaller breed dogs or bunnies too. And they can make great art projects for you and your kids, should you decide you want to decorate them with stickers, crayons, markers or paints.